A trip that had started in The Coromandel, continued into the Taupo Volcanic Zone and then had gone from Rotorua to Waitomo was now coming to an end. The last leg of our camper van adventure would be in the Northland Region of New Zealand. Before returning the camper van back in Auckland, we would get lost, swim with dolphins in the wild, and have a lazy day. The entire adventure had been amazing, and our last few memories were no exception. Our time in New Zealand was not perfect, but it taught us much more than we could have expected! For my favorite places in New Zealand, visit my post 5 Amazing Places! After a night in the Auckland area spent in the coziness and warmth of a real bed, we headed North to the Northland Region of New Zealand. We planned to start with a hidden gem, then wanted to make our way to an ancient forest and end at some bluffs. All were in relative close proximity so we were confident in our plans. The first stop of the day was Kai Iwi Lake. I had stumbled across photos of this lake while researching for the trip, and knew we had to go. The lakeshore looked like a tropical beach, when in reality it was a small lake nestled in between New Zealand’s famous green rolling hills. After spending some time marveling at the lake, we headed on to the Waipoua Kauri Forest. We never quite made it there. Our directions were unclear, signs were not well marked, and there was no one else on the roads to ask where to go. Feeling a bit defeated we raced the setting sun to make it to the cliffs for a beautiful sunset over the ocean. With our slow, old campervan we had some trouble on the windy roads, but we made it to our Google Maps location just in time. Except where we ended up was farmland, with no bluffs or ocean in sight. We followed signs through thick grass and walked carefully past electric cow fences, but never did find the cliffs. What we found instead was a unique sunset. It was not the ocean, but it was peaceful. There was no one else around while the sky turned from orange to pink around the lush green hills. Sometimes it can be good to get lost, you never know what surprises are in store! 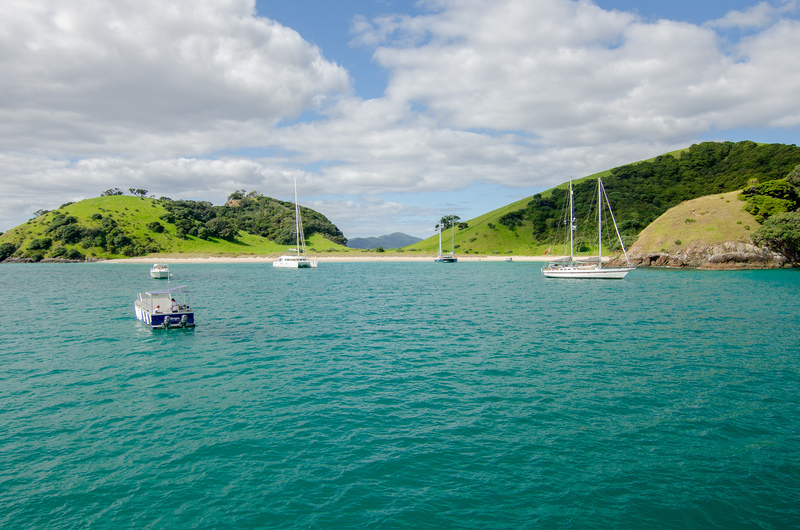 The next day was the highlight of the Northland Region: Bay of Islands. This area off the East Coast includes 144 islands spread out in a protected bay. We chose to take a day long boat trip with Fullers Great Sights. The tour would include traveling through the islands, setting foot on one, marveling at Hole In The Rock and hopefully getting to jump into the water with wild dolphins. The islands are an amazing sight, surrounded by various shades of blue water and each with their own unique features. As we traveled through we kept an eye out for dolphins, and it was not very long before we spotted our first group. Due to New Zealand’s Marine Mammal Act, if there is a baby dolphin present you cannot get into the water. This group had a baby, so we watched them curiously swim around the boat before moving on. Later that day we were lucky enough to come across another three curious dolphins. No babies in this group, so we were given the okay to get ready to jump in. I will never forget the feeling of that moment. I put on my snorkel and jumped into the cold water, leaving the safety of the boat behind. When I looked down below I saw bottlenose dolphins swimming fast, all around us. They were interested in us, not because they were forced to be but because they were curious. It can be hard to have the patience to seek out animals in the wild, especially when “swimming with dolphins” in a park or a resort is a heavily advertised tourist activity. Full transparency: I’ve done it. But interacting with animals in their own habitat is part of ocean conservation, and there’s nothing quite like seeing animals in the wild. After a long day at sea we parked our camper van for the night in a desolate region of Northland. We stayed up late watching the stars, and woke up on our last day absolutely exhausted. There was a beach at the campervan park , so we lounged there for hours. We had no motivation to get going back to the West side of the Northland region, to visit some of the famed beaches. When we finally did get going it was a slow-moving day. Our camper van seemed as tired as us, and it struggled as it chugged along climbing and winding roads to the West Coast beaches. At one point it really seemed like it was the end of its life, and it smoked from pure exhaustion. But we pressed on and made it to Piha Beach with just enough energy to walk part way down the beach. It was a beautiful beach, one that deserves much more time than we gave it. But we had to return the camper van that evening, and our turtle-like pace had put us far behind schedule. The Northland Region has much to offer in terms of beaches on the West Coast. Compared to my favorite New Zealand beaches (Coromandel) these stretches of coastline are more wild. There are serious rip tide and surf advisories posted everywhere. My advice? Don’t leave them for last. You don’t want to miss out on the beauty. Traveling can be tiring, especially after traveling an entire island by camper van for 10 days! It was finally time to return our camper van. We said our goodbyes to our affectionately named Stan that evening, and looked forward to finally sleeping in real beds. For our adventure partners, a flight would take them home to Brisbane that evening. For Adrian and I, we had one more night in New Zealand, and would spend it in downtown Auckland. After partaking in a camper van adventure, I can confidently say it is the best way to see New Zealand. The North Island is a relatively small island, but major sights are quite spaced out. It is affordable, and lets you experience the island in a way you would not by staying in hotels or Airbnbs. Our setup was stressful at times, like when we could not find food in the first few days thanks to holiday closures. It felt a bit cramped at times, especially after the letdown of our Tongariro hike being cancelled. But we also got to wake up to nature outside our window, got to eat our meals under a sky full of stars, and had a portable home wherever we went. Traveling through New Zealand was not without its flaws. We made mistakes, we had unforeseen circumstances, and we were not always happy-go-lucky when things didn’t work out. This series has been an unfiltered account of travel: both the good and the bad. Travel is far from perfect, despite what pretty pictures can make it out to be. My hope is that the next time you travel you will think of this, and remember to make light of your own unexpected situations! Your post greeted my eyes with a dash of green and blue. I love all your pictures. I haven’t been to New Zealand but would love to! Traveling is sometimes tiring but then the experiences that we gain are invaluable. Isn’t it! Thanks so much for your kind comment! New Zealand is far for anyone (except maybe Australians) but it sure is worth the long plane ride. Traveling is filled with life lessons, that’s for sure! Loving #2! Wildlife is one of the primary regions I travel because I love photography. Speaking of, also obsessing over your starry night shot! Thanks! The dolphins were super special to see, especially because there were multiple of them. Thanks so much, it was a lot of trial and error with the help of my friends who are more experienced with cameras!!! New Zealand is such an amazing place. Love the scenery photos. Even if the traveling around was a challenge, you make it look easy. Thanks for the great tips. Oh that’s such a compliment, it hardly ever feels easy. We were especially struggling the last few days with how tired we were. Hope the tips are useful! I always wanted to visit New Zealand for the hobbit houses but I think after seeing your pictures, I found a new reason to visit the wonderful country! The hobbit houses are also really cool! The North Island of New Zealand has so many differing landscapes, it is really amazing for such a tiny island. An amazing adventure! I yet need to make it to New Zealand. Thank you for your honest write up of your experience. Thanks! I like to try and include the good and not so great parts because that is real life! Hope you make it to New Zealand, it really is a beautiful area. New Zealand has been on my bucket list for so long! And I love getting lost on purpose, so it seems even more perfect! Getting lost on purpose can be so much fun, if you embrace it! New Zealand is a beautiful country, there is so much to see! Looks like you had quite the adventure. I have never traveled in a camper van and it looks like such a fun way to travel around New Zealand. The crystal clear waters in the beginning of the post were so beautiful! The crystal clear waters were such a fun hidden gem to find, there were hardly any people there at all! Camper vans are fun, but only for about 10 days. I don’t think I could have done much longer! What an adventure you had! The places you visited in the Northland Region of New Zealand looks and sounds amazing! Yes, travel can often be exhausting and frustrating that is the reality, but it’s great to share the difficulties so that others can learn from our experiences! Thanks, it was a great adventure. I love sharing the difficulties so that other people get to see both sides of traveling! It is a lot easier with two people than with four, from what I have heard. We were feeling quite cramped by the end, but it all depends on the size of your van I guess! The whole time we spent in this part of New Zealand was amazing! It was quite cold jumping into the water but I quickly forgot how cold it was when I saw dolphins swimming all around me!! !